Dehydroepiandrosterone (DHEA) burst into the public’s awareness in 1996 with lots of fanfare from the media. Proclaimed as the fountain of youth DHEA was a feature story in Consumer Digest in May, 1996. Then in September it graced the covers of USA Today and Newsweek respectively. But at the time, many conservative scientists warned us to be cautious because the studies were preliminary. We were warned that the hormone may do more harm than good. Now, today, nearly 10 years on, it is time to take a fresh look at DHEA and see if this hormone has lived up to its initial ‘hype.’ When the research is looked at in its entirety, it will be evident that DHEA has not only lived up to its promise, but in many ways it has exceeded its early predictions! DHEA (and its related metabolite DHEA-S) is the most abundant hormone in the body and is produced by the adrenal glands. Specifically, DHEA is synthesized and secreted by the zona reticularis of the adrenal cortex. It is the precursor to a number of steroid hormones such as androstenedione, testosterone and estrogen. Women secrete DHEA exclusively from the adrenal cortex, but men secrete a certain amount of DHEA from the testes. Scientists previously thought DHEA was an intermediate metabolite and had no biologic activity of its own. However, further examination of this multi-faceted hormone necessitates the conclusion that DHEA has important roles of its own. DHEA is present in large amounts during fetal development. At birth, levels drop to almost nothing and don’t reappear until adrenarche at the age of 5 or 7. 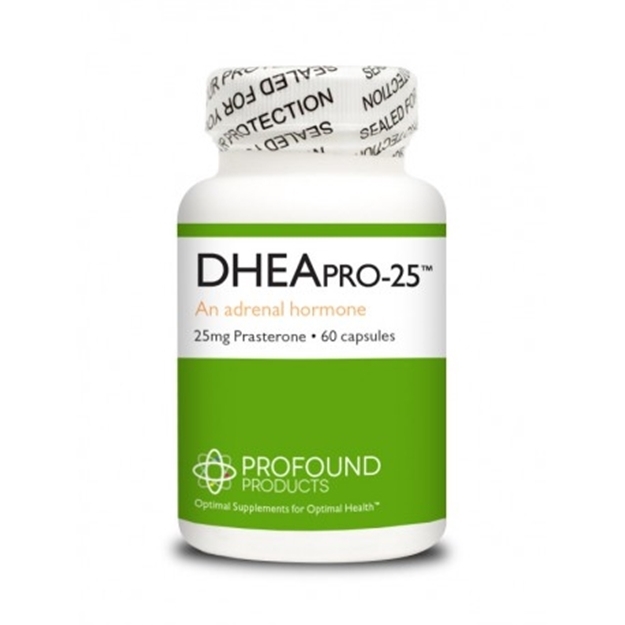 Production of DHEA starts to accelerate during puberty and reaches its peak levels at about age 24 or 25. Then the levels of this hormone begin to decline precipitously, so much so that by age 70 an average man has lost 80% of the circulating DHEA he had as a young man. (see figure 1). The obvious decline of this hormone with age, provided the initial inference that DHEA may in fact play a role in the aging process. Yet in the 20 plus years that scientists have been investigating DHEA, this hormone’s activity has still to be fully clarified. DHEA and DHEA-S are interconvertible by sulfohydrolases in adrenal and peripheral tissues. Both forms seem to be active so from here on, I will refer only to DHEA. It has recently been established that DHEA is present in significant amounts in the brain. It is actually synthesized de novo in glial cells of different brain structures and as such DHEA is considered a ‘neurosteroid’. DHEA was first isolated in 1984 and in a 1986 landmark study by Elizabeth Barrett-Connor, an epidemiologist at the University of California, she reported that in a population of 242 middle aged to elderly men, the men with the lowest levels of DHEA had the highest risk of death from all causes. This study understandably sparked tremendous interest in the newly identified hormone. At this point, low endogenous levels of DHEA had been associated with a higher incidence of heart disease, osteoporosis, cancer, diabetes, insulin resistance, obesity, inflammation, fatigue, depression, dementia and immune system dysfunction. DHEA directly opposes cortisol- the stress hormone, whose levels climb as we age. This corticosteroid is the villain responsible for many of the adverse conditions that accompany aging, including the central obesity that seems inevitable for many people at midlife. The open question is: will exogenous administration of DHEA, or DHEA replacement, result in a reversal or amelioration of the above diseases of ‘aging’? For me, the answer is a resounding yes. My opinion is based on the thousands of papers that have been published about DHEA. Whilst the human trials have been small and limited, nearly every one concludes with a positive statement and the caveat that larger, more rigorous clinical trials are needed. Furthermore, while some studies have been too short or limited to demonstrate the benefit of DHEA, none of the studies I looked at suggested DHEA replacement could be harmful. Since there are a plethora of studies which associate low levels of endogenous DHEA with diseases of aging, I am going to limit this discussion to the investigations that involved exogenous DHEA replacement in humans or animals; or well designed experiments of cells in culture. There are actually relatively few double-blind clinical trials due to the fact that pharmaceutical grade DHEA is available commercially without a prescription in the US and elsewhere. Therefore, the pharmaceutical industry has little motivation to conduct research into this intriguing molecule as it cannot be patented. Researchers in Australia combined an in-vitro and in-vivo study. They administered 100 mg./day of DHEA to 36 healthy postmenopausal women. They concluded that DHEA increased endothelial cell proliferation in culture, (in a Petri dish) and enhanced large and small vessel endothelial cell function in postmenopausal women. Another group in Japan gave 25 mg./day of DHEA to 24 men (average age 54) with high cholesterol. This controlled open trial found that DHEA replacement in these men improved vascular endothelial function, (artery flexibility) and reduced plasma glucose. A group of researchers working at the Mayo Clinic showed in a randomized, double-blind, placebo-controlled, crossover study- that DHEA replacement of 50 mg. per day in hypoadrenal women significantly improved insulin sensitivity thereby suggesting that DHEA replacement could have a potential impact in preventing type-II diabetes. This study is just one of many studies that suggest DHEA may play a role in preventing type-II diabetes. DHEA is a weak androgen that has anabolic properties. It is the anabolic properties that make DHEA an important adjunct to weight control. In November 2004 a landmark study was published. Researchers from the University of Washington in St. Louis conducted a randomized, double-blind, placebo-controlled trial involving 28 men and 28 women, age range 65-78 years. The 56 people were randomized to receive 50 mg. per day of DHEA or placebo for 6 months. The drop out rate was small. At the primary endpoints, the researchers were looking at abdominal and visceral fat, (as measured by MRI) and glucose/insulin responses to an oral glucose tolerance test. DHEA induced significant decreases in visceral and subcutaneous fat as compared to the placebo group. In addition, the DHEA treated group experienced a significant improvement in insulin sensitivity. The authors concluded DHEA replacement could play a role in prevention and treatment of metabolic syndrome associated with abdominal obesity. One of the more recent and most provocative DHEA studies was just published in February of this year (Ed.- 2005). It was conducted at the National Institute of Mental Health (NIMH) in Rockville, Maryland. Again, this was a double-blind, randomized, placebo-controlled, crossover treatment, (considered to be the gold standard even amongst the most conservative of scientists). This trial was undertaken due to the fact that there were numerous anecdotal reports of the anti-depressant effect of DHEA. In this study DHEA was given as a monotherapy treatment for midlife-onset major or minor depression. There were 23 men and 23 women (ages 45 to 65 years) who participated. The treatment group received 90 mg. per day of DHEA for 3 weeks and 450 mg. per day for 3 weeks. The results showed that 6 weeks of DHEA treatment was associated with significant improvement in depression based upon two well recognized depression rating scales. In addition, 6 weeks of treatment was also associated with significant improvements in sexual function relative to baseline and placebo controls. (If I can divert here from my objectivity as a writer, I beg your indulgence. How many of us knew anything about the results of this clinical trial? I suspect very few. The popular press is so quick to pick up the studies that show a vitamin or nutrient may be harmful, while preposterous claims of new pharmaceuticals drugs often precede by years the release of a new patented agent. The trials that implicate a possible harmful effect of a vitamin or nutriceutical are so often exaggerated. Yet, in this case, a commonly available supplement showed itself to be an extremely effective treatment for depression. Depression is a condition that affects the quality of life of millions of people. Sales of antidepressants account for billions of dollars in the global economy. But there are problems with many antidepressants. Most antidepressants take 4-6 weeks before any benefit is experienced by the person suffering from this debilitating condition. Many of these antidepressants have sexual dysfunction as a common side effect so physicians throw another pharmaceutical at that condition whether it is Viagra or another antidepressant such as Wellbutrin. And the cycle continues. This small study showed a common, inexpensive nutrient to have a remarkable benefit. In my opinion, the results of this trial should have been shouted from the rooftops. In my own clinical practice, I have DHEA to be one of the single best nutrients to quickly improve a person’s sense of well-being, overall mood, and energy levels). DHEA is an androgen with anabolic properties, so it is not surprising that studies have shown it to be beneficial in the treatment of osteoporosis. In fact, unlike the current pharmaceutical treatments for osteoporosis which only stop further bone loss, it appears DHEA can actually help a person build back some of the bone they have lost. A well known side effect of treatment with glucocorticoids, (steroids like prednisone) is osteopenia and osteoporosis. Many women with systemic lupus (SLE) rely on prednisone to keep their disease in check. Consequently these young women develop premature osteoporosis. It is an iatrogenic effect, (a disease state which is the result of a physician’s intervention). In April, the results of randomized, double-blind trial were published. The study showed DHEA treatment prevented bone mineral density, (BMD) loss and significantly increased BMD at both the lumbar spine and total hip in female patients receiving exogenous glucocorticoids. Another trial showed men with osteoporosis who were treated with 100 mg. per day of DHEA for 6 months experienced an increase in their BMD vs. those treated with a placebo. Importantly, in this study the researchers noted no change in the PSA of the men who received the DHEA treatment. PSA (prostate specific antigen) is used as a measurement of prostate cancer. So often the ‘nay sawyers’ warn that administration of DHEA may initiate the growth of latent prostate tumors, but this study is one more assurance of the safety of DHEA. In fact, there is at least one paper that suggests prostate cancer may be prevented by the administration of DHEA. DHEA levels decline with age and the incidence of cancer increases with age. It is this connection that has prompted researchers to look at DHEA as a chemopreventive agent. Researchers in Japan found that DHEA could inhibit the proliferation of myeloma cells and the IL-6 production of bone marrow cells withdrawn from patients with myeloma. IL-6 is a marker of inflammation and unwelcome cell proliferation in cancer. In a study in animals that were given a cancer-causing agent, DHEA reduced the number of aberrant crypt foci, which are thought to precede the development of colon cancer. The role DHEA in the brain definitely needs more study. The data is scant and conflicting. Our characterization of these ‘neurosteroids’ is in its infancy. A small randomized, double-blind, placebo-controlled study of the use of DHEA as a treatment in Alzheimer’s Disease (AD) narrowly missed showing statistical significance, although the treatment was well-tolerated. A group of researchers found that DHEA increased the growth of human brain cells in an in-vitro study. DHEA treatment caused as much as a 29% increase in the number of neurons produced by stem cells. Low endogenous levels of DHEA are found in a number of different dementias and AD. In an animal study, delayed administration of DHEA improved recovery of function after traumatic brain injury from stroke. A very recent paper suggests that the decreased release of the angiogenic peptide, vascular endothelial growth factor (VEGF) plays a pivotal role in AD and vascular AD (VAD). Their data suggests “insulin and DHEA could have beneficial effects in AD, as well as VAD and physiological aging, by increasing, in a dose-dependent fashion, VEGF availability by peripheral and resident immune and endothelial cells, so contributing to increase its circulating pool.” As research continues, the role of DHEA in central nervous system pathologies will become clear. Certainly, one of the consequences of aging is a decline in the function of the immune system. DHEA replacement has been found to restore an aging immune system to that of a younger person. Much of what we know about DHEA replacement comes from clinical trials where DHEA was administered to women with SLE. These studies found that DHEA down regulated levels of IL-6. IL-6 is one of many inflammatory cytokines that is a significant mediator of inflammation. Inflammation is now thought to play a role, not only in inflammatory autoimmune diseases such as rheumatoid arthritis (RA) and SLE, but also in the chronic conditions that develop with age such as heart disease, cancer, and cognitive decline. In the case of SLE, DHEA also helped up regulate IL-2 production of normal T cells and at least in an animal model of lupus, reversed their clinical autoimmune diseases. It is probably obvious at this point that DHEA administration is able to reverse many of the negative symptoms that accompany aging. A well designed study conducted in Italy has shown just that. Researchers administered long term (1 year) low dose (25 mg./day) DHEA in a group of aging men who presented with symptoms clinical symptoms of a partial androgen deficiency. According to the researchers, the men who received DHEA supplementation experienced a progressive improvement in mood, fatigue, and joint pain. DHEA and its biologic activity have yet to be fully characterized. It exerts its beneficial effects through a number of different mechanisms. One theory is that DHEA is a potent, uncompetitive inhibitor of glucose-6-phosphate dehydrogenase (G6PDH). DHEA lowers NADPH levels and reduces NADPH-dependent oxygen free radical production. Oxidative stress increases inflammation and cellular proliferation and is believed to play a critical role in the development of cancer, atherosclerosis, and AD, as well as the basic aging process. Another possible mechanism for the antiaging effects of DHEA is direct opposition to cortisol. As we age, out its DHEA/cortisol ratio tips in favor of cortisol. The negative effects of cortisol are well-known. According to one scientist, “several clinical signs might be related to the decline of DHEA secretion in aged people: sarcopenia (age-related decrease in skeletal muscle mass), osteopenia, atherosclerosis progression, impairment of cognitive and affective performances, deterioration of immunocompetence are the most significant evidences.” DHEA reduces levels of IL-6 and other cytokines associated with inflammation, while stimulating insulin-like growth factor-1 (IGF-1). This ability to reduce inflammation while increasing IGF-1 clearly plays a role in the beneficial effects of DHEA. The role of DHEA as a neurosteroid has yet to be fully elucidated and will inevitably be the subject of future scientific papers. I believe when this data is taken in its entirety, there is a strong case for both men and women to consider adding DHEA to their antiaging program. The weight of the evidence makes it clear DHEA is safe and well-tolerated. How much any individual should take remains an open question. The dosages in the studies I highlighted here range from 25-450 mg. I think there is little reason to take as much as 450 mg. of DHEA. I often tell my clients to start with 25 mg. If they do not see an improvement in their sense of well-being, energy levels and cognition within one week, they should increase the dose. I feel comfortable recommending up to 100 mg. per day of DHEA, since each of us is so biochemically different. As far as DHEA living up to its claims that it is the ‘fountain of youth’, I believe the evidence demonstrates this claim is not an exaggeration. Pepping J. DHEA: Dehydroepiandrosterone. Am J Health-Syst Pharm 2000; 57(22):2048-2056. Mo Q, Lu SF, Simon NG. DHEA and DHEA sulfate differentially regulate neural androgen receptor and its transcriptional activity. Brain Res Mol Brain Res. 2004;126(2):165-72. Barrett-Connor E, Khaw KT, Yen SS. A prospective study of dehydroepiandosterone sulfate, mortality, and cardiovascular disease. New Eng J Med 1986; 315:1519-1524. Leowattana W. DHEA(S): the fountain of youth. J Med Assoc Thai. 2001; 84 Suppl 2:S605-12. Tchernof A, Labrie F. Dehydrodpiandrosterone, obesity and cardiovascular disease risk: a review of human studies. Eur J Endocrinol. 2004;151(1):1-14. Valenti G. Neuroendocrine hypothesis of aging: the role of corticoadrenal steroids. J Endocrinol Invest 2004;27 Suppl(6):62-3. Williams MR, Dawood T, Ling S, et al. Dehydroepiadrosterone increases endothelial cell proliferation in vitro and improves endothelial function in vivo by mechansisms independent of androgen and estrogen receptors. J Clin Endocrinol Metab 2004;89(9):4708-15. Kawano H, Yasue H, Kitagawa A, et al. Dehydroepiadrosterone supplementation improves endothelial function and insulin sensitivity in men. J Clin Endocrinol Metab 2003;88(77)3190-5. Dhatariya K, Bigelow ML, Nair KS. Effect of Dehydroepiandrosterone replacement on insulin sensitivity and lipids in hypoadrenal women. Diabetes 2005;54(3):765-9. Villareal DT, Holloszy JO. Effect of DHEA on abdominal fat and insulin action in elderly women and men: a randomized controlled trial. JAMA 2004 10;292(18):2243-8. Schmidt PJ, Daly RC, Bloch M et al. Dehydroepiandrosterone monotherapy in midlife-onset major and minor depression. Arch Gen Psychiatry 2005; 62(2):154-62. Mease PJ, Ginzler EM, Gluck OS, et al. Effects of prasterone on bone mineral density in women with systemic lupus erythematosus receiving chronic glucocorticoid therapy. J Rheumatol 2005;32(4):616-21. Sun Y, Mao M, Sun L, et al. Treatment of osteoporosis in men using dehydroepiandrosterone sulfate. Chin Med J (Engl) 2002;115(3):402-4. Algarte-Genin M, Cussenot O, Costa P. Prevention of prostate cancer by androgens: experimental paradox or clinical reality. Eur Urol 2004;46(3):285-94. Liu S, Ishikawa H, Li FJ, et al. Dehydroepiandrosterone can inhibit the proliferation of myeloma cells and the interleukin-6 production of bone marrow mononuclear cells from patients with myeloma. Cancer Res 2005;65(6):2269-76. Aoki K, Nakajima A, Mukasa K, et al. Prevention of diabetes, hepatic injury, and colon cancer with Dehydroepiandrosterone. J Steroid Biochem Mol Biol 2003;85(2-5):469-72. Wolkowitz OM, Kramer JH, Reus VI, et al. DHEA treatment of Alzheimer’s Disease: a randomized, double-blind, placebo-controlled study. Neurology 2003;60(7):1071-6. Suzuki M, Wright LS, Marwah P, et al. Mitotic and neurogenic effects of Dehydroepiandrosterone (DHEA) on human neural stem cell cultures derived from the fetal cortex. Proc Natl Acad Sci USA 2004;101(9):3202-7. Hoffman SW, Virmani S, Simkins RM, Stein DG. J Neurotrauma 2003;20(9):859-70. Solerte SB, Ferrari E, Cuzzoni G, et al. Decreased release of the angiogenic peptide vascular endothelial growth factor in Alzheimer’s disease: recovering effect with insulin and DHEA sulfate. Dement Geriatr Cogn Disord 2005;19(1):1-10. Suzuki N, Suzuki T, Sakane T. Hormones and lupus: defective Dehydroepiandrosterone activity induces impaired intereleukin-2 activity of T lymphocytes in patients with systemic lupus erythematosus. Ann Med Interne (Paris) 1996;147(4):248-52. Genazzi AR, Inglese S, Lombardi I, et al. Long-term low-dose Dehydroepiandrosterone replacement therapy in aging males with partial androgen deficiency. Aging Male 2004;7(2):133-43. Schwartz AG, Pashko LL. Dehydroepiandrosterone, glucose-6-phosphate dehydrogenase, and longevity. Ageing Res Rev 2004;3(2):171-87. Valenti G. Andropause: an imbalance between Dehydroepiandrosterone (DHEA) and cortisol secretion. J Endocrinol Invest 2002;25(10 Suppl):29-35. Haden ST, Glowacki J, Hurwitz S, et al. Effects of age on serum Dehydroepiandrosterone sulfate, IGF-1, and IL-6 levels in women. Calcif Tissue Int 2000;66(6):414-8. Description: DHEA is the most abundant of the body’s hormones, yet levels are known to decline steadily with age. DHEA is the metabolic precursor to both androgens and oestrogen’s, which are necessary for optimal function. Directions: Take 1 capsule daily or as directed by your health professional. Other ingredients: Rice flour, magnesium stearate, gelatine capsule.